Horse Chestnut is a medium sized deciduous tree that is native to Greece but has been grown in North America for hundreds of years. It produces large nuts. 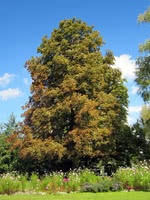 Siberian Elm is a small to medium-sized deciduous tree. It has a similar form to American Elm, but smaller, with a more pyramidal habit and shorter lifespan. 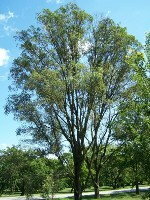 It is also more resistant to Dutch Elm disease and is very salt tolerant. Siberian Elm was grown as shelterbelts in the prairies after the Dustbowl disasters, where its rapid growth and tolerance for drought and cold initially made it a great success. It is an excellent shade tree. Note: Due to it's increasingly controversial reputation for being invasive in warmer climates, we are no longer planning to grow this species for retail purchase. Toxicity: raw Horse Chestnut seed, leaf, bark and flower is toxic if ingested due to the presence of esculin.